Credit: Zrinka Ljubesic, University of Zagreb. Download this image (PNG, 420 KB). 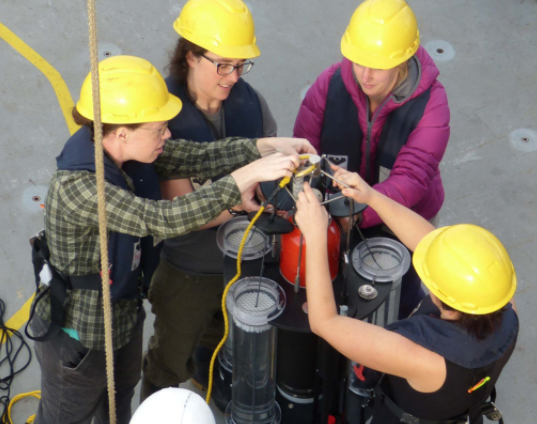 [30-Jan-17] Colleen Durkin (left) of Moss Landing Marine Lab and Melissa Omand of the University of Rhode Island ready sediment traps assisted by the ship crew. The aluminum block below one trap includes an iPhone camera programmed for time-lapse image collection, which will be used for holographic research in collaboration with Brown University.